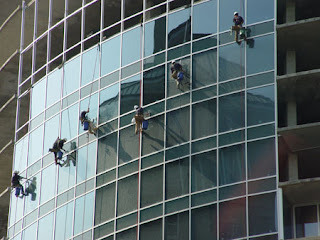 Our commercial window cleaning services in Pensacola FL are professional and affordable. When comparing our professional window cleaning services to those of other window cleaners, our commercial window cleaning services are often considered to be superior by our clients. We believe that commercial window cleaning requires a professional image, dedication to high rise window cleaning safety, and also getting the window cleaning job done right the first time. We focus our commercial window cleaning business to cater to the needs of our commercial professional window cleaning clients. While commercial window cleaning services require safety and quality, we also know that in the window cleaning business, our clients are looking for affordable prices for window washing services. Our window cleaning price often remains unchanged for our annual window cleaning service. We know that other window cleaning companies sometimes provide a window cleaning estimate, and then increase the window cleaning prices every year. This may produce an initial window cleaning cost that is very low, but result in high window cleaning prices after the first year. Give us a call today in order to get a free commercial window cleaning estimate where we will provide our window cleaning prices. 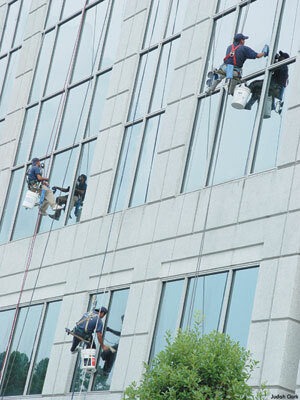 Our company provides interior and exterior, high and low-rise window cleaning services. Our window cleaning will leave the appearance of your windows better than you or your tenants can imagine. After our services are performed, customers often compliment on the improved working atmosphere generated from the enhanced clarity of the windows. We specialize in high quality, state-of-the-art window cleaning that will not cause costly problems in the future, but will keep your building looking better longer. We use Scumfrees Professional Window Cleaning Concentrate and Deionized Water that leaves little to no residue compared to commonly used dish soaps and tap water with a high mineral content. Unfortunately, these industry standard methods can actually create the glass stains seen on most building windows today. The picture below shows a high rise window cleaning technician allowing the soapy window cleaning mixture used to clean the windows to run down into the window frames as well as the precast where it remains until the next rain. The window cleaning additives commonly used in the industry are dish washing detergents which are petroleum based and leave a sticky residue on all surfaces that attract dirt from the environment and glue them to architectural surfaces. We have determined the right formula for keeping your windows clean and stain-free. Furthermore, your windows will remain cleaner longer; each time it rains, sticky residue will not be washed down from the ledges onto the window below. More information about the cause of glass stains can be found at www.IsYourBuildingGreen.com Or to download a brochure that explains the complicated matters of exterior building restoration and maintenance and how properties can save millions on implementing new and improved technology. Whats Your Return on Investment? WINDOW CLEANING OR GLASS RESTORATION? Many times we are called by a new potential customer and asked if we can do window cleaning only to find out the windows haven't been cleaned in so long they can't be cleaned with standard window cleaning proceedures and require glass restoration services. Standard window cleaning procedure involves gently scrubbing the window with a brush soaked in water and if nesesary, a diluted window cleaning detergent such as Scumfrees. A squeegee is used to remove the dirty mixture from the glass with precision and towels are used to clean the edge of the windows and the frames. Glass restoration however can involve the use of motorized polishers, chemicals and or abrasives and is much more labor intensive and costly. Restoration of window glass can cost 100 to 500% more than standard window cleaning. To learn more about glass restoration. Below is a before and after picture of a window that has been restored using our specialized products and services. As you can see the difference is very noticeable. Standard window cleaning would not remove the stains on this window. When our company provides regular maintenance for your building after performing our glass restoration services, you may be eligible for a lifetime warranty against future glass stains. Our warranty covers both products and labor. Our warranties are contingent upon the proper maintenance of the property. The use of our specialized products and techniques is critical, because we have found the use of inferior products and lack of required maintenance to be a major cause of building staining. Standard window-cleaning detergents, tap water with a high mineral content and inferior water repellents are the three major causes of Brown Building Syndrome. Presto Restoration Products product line is designed to work synergistically to clean and restore the various architectural materials present on each property. Trust your property to a professional company that is experienced in keeping buildings brand new. We understand that image is everything. Our company uses the environmentally friendly window cleaning products made by Presto Restoration Products.